Cancer is a group of diseases that can occur almost without any sign or symptom. Usually, the when Cancer is accompanied by signs and symptoms, it has determining factors like location, its magnitude and the extent of its effect on organs and tissues. 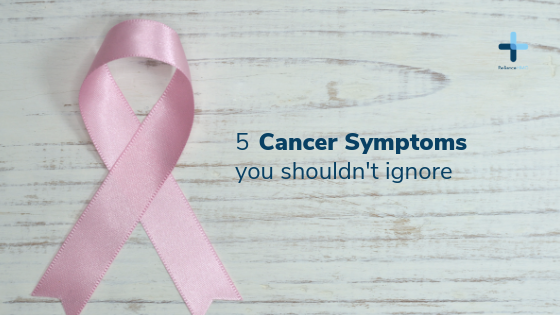 When a cancer has spread signs or symptoms may appear in different parts of the body. Because Cancer often has no specific symptoms, it is important that people limit their risk factors and undergo appropriate cancer screening. Most cancer screening is specific to certain age groups and the type of screening to undergo would be largely depended on that . People with risk factors for cancer – smokers, heavy alcohol use, high sun exposure, genetics – are more prone to cancer and the best way to fight cancers is by eliminating or decreasing these risk factor and early detection. What are some general signs and symptoms of cancer? While there are specific signs and symptoms that could point to cancerous cells, having these signs doesn’t validate your having cancer. The symptoms could be as a result of another ailment. That said, If you have any of these symptoms listed below, and they last for a long time or get worse, please see a doctor to find out what’s going on. One of the first signs of cancer is unexplained consistent weight loss. An unexplained weight loss of 10 pounds or more may be the first sign of cancer. This is common with cases regarding cancers of the pancreas, stomach, esophagus (swallowing tube), or lung. Fever is very common with cancer, but it more often happens after cancer has spread from where it started. Almost all people with cancer will have fever at some time, especially if the cancer or its treatment affects the immune system. Fatigue, i.e extreme tiredness, that never seems to get better even after rest can also be a sign of cancer. When you start to notice blood in unusual places, be worried, you might have cancer. Blood after a cough, blood in the stool and urine, nose bleeding can all be a sign of cancer. Cancer of the cervix or the endometrium (lining of the uterus) can cause abnormal vaginal bleeding. Skin changes as well as change in the color, size, shape or sharpness of a mole, wart, freckle should not be dismissed. Alert your physician immediately. A skin change may be a melanoma which, if found early, can be treated successfully. Some changes in bowel and bladder habits like unusual diarrhea, urinal pain, change in bladder function (needing to pass urine more or less often than usual), long-term constipation, or a change in the size of the stool may be a sign of colon cancer or could be related to bladder or prostate cancer.